The Morado living card includes a simplistic arrangement of long lasting flowers including statice, chrysanthemums, solidago and waxflower. 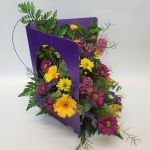 A tasteful selection of purple, yellow and deep cerise tones. Send a flowery greeting with our Living Cards. A wonderful way to celebrate any occasion. 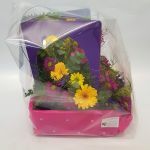 The joy of selecting an arrangement for your recipient is all of the flower arranging has been taken care of by our expert florists - all your recipient has to do is water and enjoy the display! Arrives Giftwrapped for that extra wow factor.